Mystery piano in woods perplexes police. (CNN) — Was it a theft? A prank? A roundabout effort to bring some holiday cheer to the police? Authorities in Harwich, Massachusetts, are probing the mysterious appearance of a piano, in good working condition, in the middle of the woods. 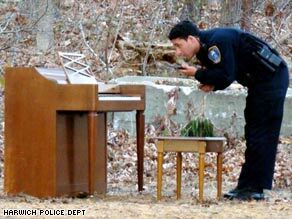 A police officer examines an oddly placed piano in the woods of Harwich, Massachusetts. Discovered by a woman who was walking a trail, the Baldwin Acrosonic piano, model number 987, is intact — and, apparently, in tune. Sgt. Adam Hutton of the Harwich Police Department said information has been broadcast to all the other police departments in the Cape Cod area in hopes of drumming up a clue, however minor it may be. But so far, the investigation is flat. Also of note: Near the mystery piano — serial number 733746 — was a bench, positioned as though someone was about to play. The piano was at the end of a dirt road, near a walking path to a footbridge in the middle of conservation land near the Cape. It took a handful of police to move the piano into a vehicle to transport it to storage, so it would appear that putting it into the woods took more than one person. Asked whether Harwich police will be holding a holiday party in the storage bay — tickling the ivories, pouring eggnog — while they await word of the piano’s origin and fate, Hutton laughed. No such plans.